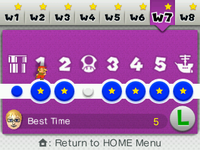 World 7-1 is the first level of World 7 in Super Mario 3D Land. This level is reminiscent of World 3-2. Mario starts this level on a grassy area with flowers, a wooden pipe board and a Coin Coffer. Near of this place, there is a large pool of water. The goal is right ahead and can be quickly accessed by a Wall Jump on the wall, or the player may use a Tanooki Suit to cross the gap. Although, Mario must jump on the pool to collect Star Medals. Mario must swim down, until reach in an area with some crates, two Cheep Cheeps and a P Switch. Pressing it, the wall on the right reveals a passage. After crossing some thorny flowers, Mario faces two Porcupuffers guarding another passage. This passage splits into two. Swimming through the first opening, Mario can break many Brick Blocks to get a + Clock. In the second opening, Mario is taken by a stream to the Checkpoint Flag. Then, he must swim inside a U-shaped hollow, where are four Spike Eels and a single Porcupuffer. Mario reaches inside a dry area with a Warp Pipe, a Piranha Plant and Crates. The pipe leads Mario to the ending area, with more Warp Pipes, another Piranha Plant and the Goal Pole. The entire level can be skipped if one comes to the level with a Super Leaf or Statue Leaf on hand; the player can simply float over the water and directly into the flagpole, giving best times of as little as five seconds. Star Medal 1: Upon entering the water, the player should head to the bottom left. Behind the crates is the first Star Medal. Star Medal 2: The second Star Medal is found directly beneath the second Spike Eel of the column of the three. 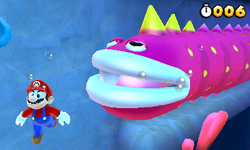 It can only be obtained if the Spike Eel is defeated or if it moves to attack while the player is behind it. Star Medal 3: The final Star Medal is found shortly after the second one. It is located inside a cave with another Spike Eel.